MamaBreak: Jennifer Falls and Chicken Soup for the Soul Giveaway! 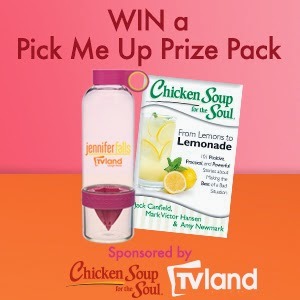 Jennifer Falls and Chicken Soup for the Soul Giveaway! One of my newest obsessions is infused water! I LOVE infused water bottles, and am so excited to offer this giveaway to my readers! Not only will the winner get a Citrus Zinger bottle from Jennifer Falls, but they will also get a Chicken Soup for the Soul: From Lemons to Lemonade: 101 Positive, Practical, and Powerful Stories about Making the Best of a Bad Situation book! The perfect summer read. I saw the previews this weekend and it looks like such a fun show! Chicken Soup for the Soul JUST launched their Get Happy App (which we are using for daily motivation). It is FREE!!! This post contains referral and/ or affiliate links. We only recommend things we think our readers will love. As always, our experiences and opinions are our own. Enter for the prize pack below!